Many times over the last several years, I’ve driven by Brandi’s World Famous Hot Dogs, but I’ve never been by when the “Open” sign was in the windiw. They’re open 10:00 – 3:00, Monday – Friday, and my schedule never seemed to mesh with their hours. Nearly in downtown Marietta (they’re just down the street from the Red Eyed Mule, on whatever they call that piece of Bell’s Ferry Road between US 41 and Highway 5), it’s rare that I’m in that area in the middle of a weekday. Today was the perfect opportunity – I was leaving an appointment in Kennesaw and driving down I-75, right past the highway five exit, so I though that I’d give Brandi’s a try. At 12:15, it was already filled with what appeared be regulars, as the conversation was constant (and lively) among everyone in the place. She also clarified what I wanted on the cheeseburger (they come with mustard, onions and chili, just like the dogs) – again I held the onions. I reached for my money to pay (note that they are cash only) and she told me to find a seat and they’d bring it to me. I found a spot on the corner of the L-shaped counter that surrounded the kitchen area. There were also several tables at the front of the restaurant. At this point, I wasn’t sure exactly what I was in for, but I pulled a paper towel off the roll to make my place mat, filled my cup of ice at the fountain and waited. 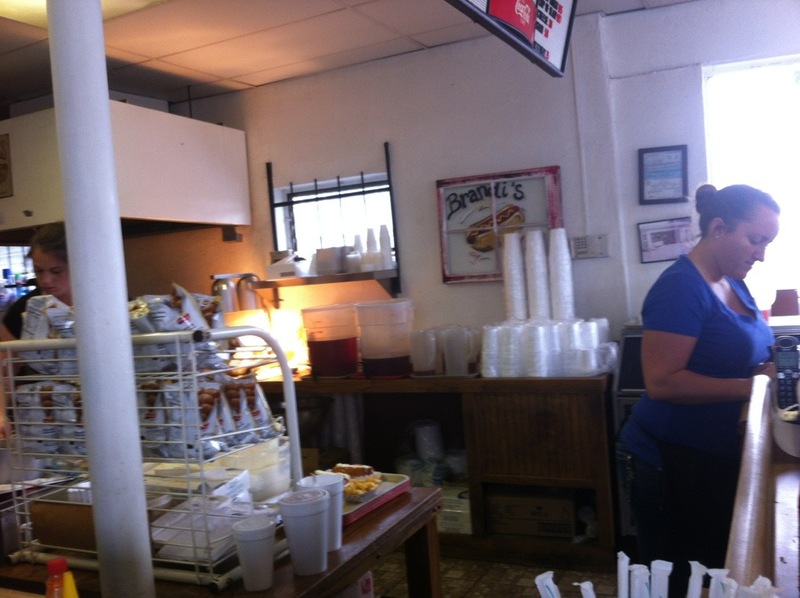 Then the fellow sitting next to me started his conversation with “they sure got it hot today..” Shortly, one of the three ladies behind the counter appeared brandishing a tray full of hot dogs, chili dogs, slaw dogs and cheeseburgers. None of these were mine so I waited and watched. A few minutes later I found out just hot it was. and the cheeseburger itself was so bland that the chili on it didn’t make much impact. Sitting at the counter next to me, were two folks from the Cadillac dealership nearby. 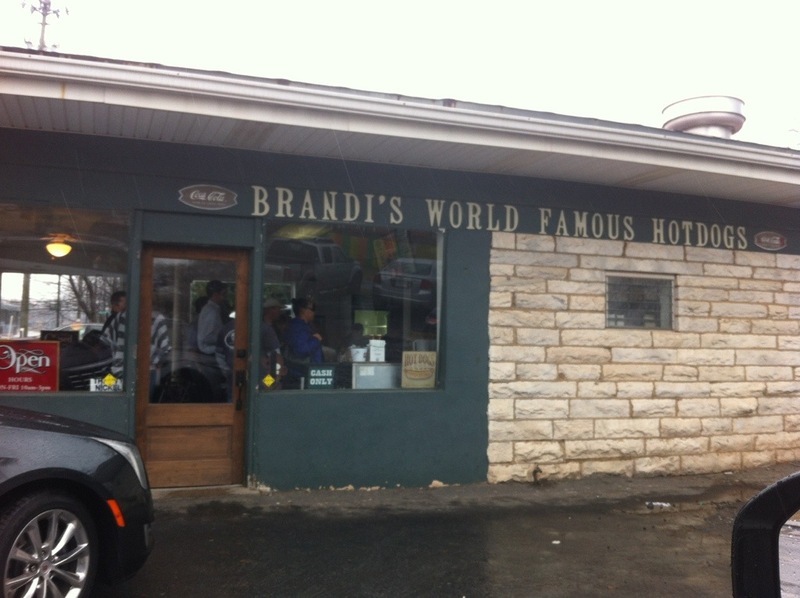 While I was eating, I heard their conversation and gathered that they’d qualify as “regulars” – they discussed how they used to come to Brandi’s every Thursday, but they’d cut back to make a trip every other or every third week. They did know enough to order their dogs “drained”, and the chili on their dogs didn’t look nearly as runny as mine. I’ll keep that in mind if I go back. It’s definitely a good spot for chili dogs, but I wouldn’t recommend it for a hamburger. Everyone around me seem to be having slaw on their chili dogs, and while I’m not a slaw fan, I can see how the combination of coleslaw and hot chili might make for a good combination. Yeah, I can never eat their hot dogs unless their drained. My family loves the place, but I’d much rather the Varsity. 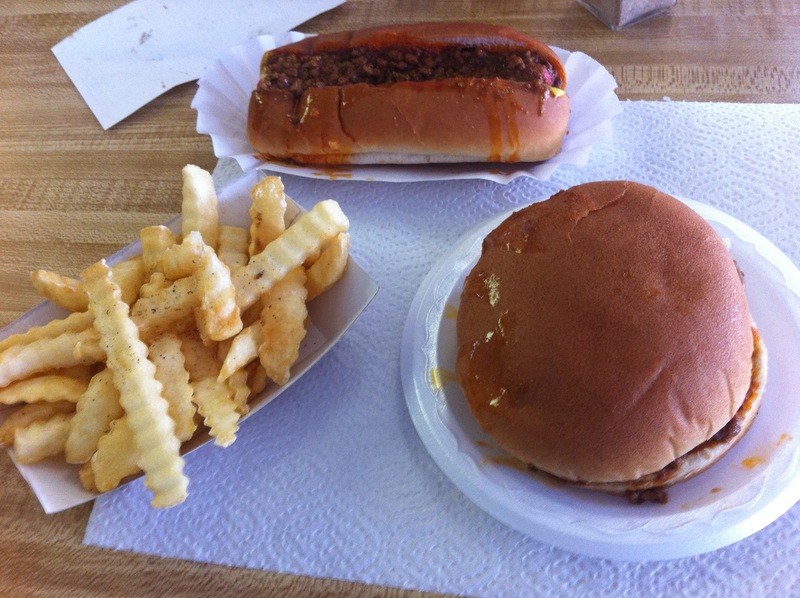 The Varsity is better, but I still prefer the chili dogs at Bill’s Barbecue House in Lithia Springs to either. i love this place but about every third week would suit me about right too.